What Are the Benefits of Herndon Dental Implants? You feel that sinking sensation in your stomach as you walk into the restaurant to meet your friend. What will you be able to order and eat in front of them without embarrassing yourself? You have a missing tooth that makes chewing your food awkward, and you’re wondering if you’re going to have to resort to eating soup again. Did you know that Herndon dental implants can help you eat and chew with ease while also giving you your smile back? 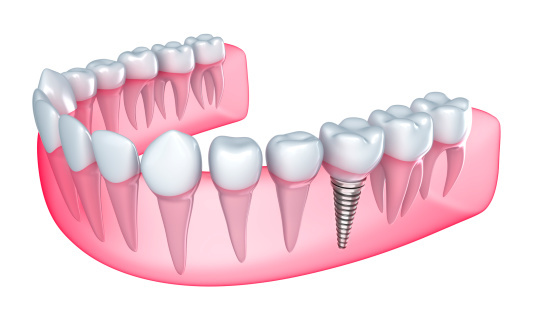 A dental implant uses a titanium post placed into your jawbone to replace the missing root of your tooth. Because titanium is biocompatible, it will naturally integrate and fuse with your bone so it acts just like your natural tooth root. After a period of healing for the implant, a crown is then attached which restores your smile and returns the function you lost with your missing tooth. While you are thinking about how frustrating it is to try and eat at a restaurant, you may not realize what’s going on with your oral health behind the scenes. When you lose a root, your jawbone has nothing left to support and it stops regenerating bone. The bone loss can eventually affect neighboring teeth and could result in more tooth loss. Meanwhile, your surrounding teeth may begin to shift and move into the open space left by your missing tooth, causing bite misalignment, and an increased risk of developing fractures and gum disease. Replacing your tooth with a dental implant not only allows you to chew and eat with ease again, but also protects your dental health. Dental implants look, function, and feel like a natural tooth, and you’ll be able to brush and floss just as you were used to. This is a very reliable treatment procedure that offers a 95% success rate. An implant has the potential to last for a lifetime with a great home care routine and regular checkups with your dentist. Because of its great longevity, a dental implant is a wise investment since other tooth replacement options have to be replaced in the future. Dental implants are also capable of replacing multiple teeth by supporting dental prosthetics such as a bridge or denture. If you would like to learn more about dental implants and if they might be the right treatment to restore your smile, contact your dentist today to schedule a consultation. Dr. Sonia Dilolli provides high quality dentistry to patients in Herndon, VA and the surrounding communities of Reston and Great Falls. Her skills and extensive training allow her to offer comprehensive implant dentistry to her patients, which means she’ll be guiding you through the process from start to finish. If you’d like to contact Dr. Dilolli, she can be reached by calling 703-478-9574 or through her website. Comments Off on What Are the Benefits of Herndon Dental Implants?